Known for its highest density of tiger population, Bandhavgarh National Park happens to be one of the most haunted wildlife havens in India. Bandhavgarh national park remains snuggled up in the Vindhya Ranges of the state of Madhya Pradesh. The total coverage area of the park measures 437 sq km. Bandhavgarh wildlife park served as the hunting preserve of the Maharaja of Rewa before being declared as a national park in the year 1968. The terrain of the park comprises rocky hill ranges, grassy swampland and wooded valleys. The low-lying area of the park is dominated by sal tress whereas the high-altitude areas have a mixed type of vegetation. A variety of sights and sounds await the visitors in the forests of the Bandhavgarh National Park. 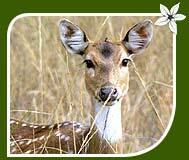 Bandhavgarh national park shelters a good number of both animal and bird species, a side from the reptile species. The possible sightings in the park include tiger, leoprad, gaur, spotted deer, sambhar deer, dhole, nilgai, sloth bear, wild boar, rhesus macaque, jackal, fox, wild dog, hyena, chausingha and ratel among others. Apart from the tigers of Bandhavgarh, other species that have attracted the attention of wildlife lovers include larger specimens of wild boar, sambhar deer and barking deer, observed anywhere in the country. Besides watching and photographing the above-mentioned animal species, You can also enjoy observing numerous species of birds. 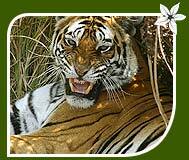 Bandhavgarh national park has to boast around 250 avian species. Tourists can easily sight bird species like peacock, paradise fly catchers, Jungle fowl, golden and black headed orioles, yellow ioras, red-vented bulbuls, blue jays, purple sunbirds, green barbets and mynahs among others. The historical remains of the Kalchuri period are a must-visit for all. So, after you have done with your wildest of experiences, do remember to pay a visit to this pieces of history. One of the biggest draws for visitors to the Bandhavgarh National Park, apart from the exotic species, is the Bandhavgarh Fort, dating back 2,000 years. The PWD and the Forest Department run guesthouses inside the national park. Those who are looking for a uniquely wild experience can plan their stay here. Those who prefer the air route need to fly to Khajuraho first. 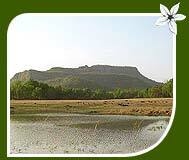 Further, they can hire a taxi or a take a bus to reach the Bandhavgarh National Park. From Khajuraho (237 km) to the national park is a five-hour drive. Getting to the national park using the rail route is also a much convenient option. There are three railheads  Jabalpur (164 km), Katni (102 km), Satna (120 km); all of these lie on the central railway track. By road, tourists can access the park from places like Jabalpur, Satna, Katni, Umaria, Bilaspur and Khajuraho. A number of jungle lodges and resorts function here. Equipped with all the modern amenities, these resorts are sure to give you a unique experience of stay.